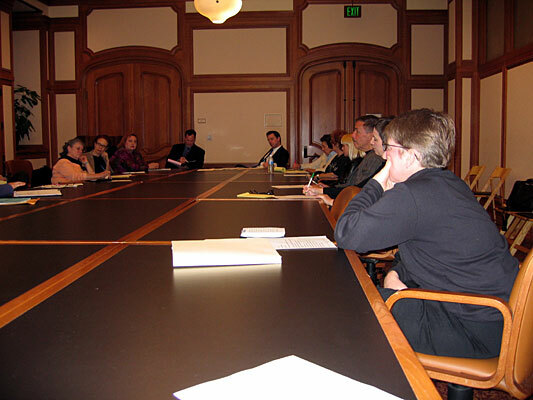 Mayor Gavin Newsom listens to the constituents. The Mayor of San Francisco Gavin Newsom takes time to visit the Bayview and while doing so gauges for himself by talking, seeing, and visiting the constituents of the Bayview. Today, November 17, 2004 together with other very young children we had his handprints on the sidewalk by Palou. There is no doubt that our youth in the Bayview are getting better attention and the constituents at large do not feel left out as when Mayor Willie L. Brown Jr. did - by not taking care of the constituents and never spending time talking to the constituents adversely impacted in past years. We cannot address Quality of Life issues if we do not have real or empirical data. To deal with pollution issues, transportation, housing, energy, clean drinking water, education, health and safety issues we need empirical data. The last for example empirical data was collected on pollution in the Bayview Hunters Point Area was in 1990. In the year 2004 we have the best technology and mandates that can address and penalize those polluters who kill our babies and adversely impact the constituents in general who live in the Bayview Hunters Point. However in the year 2004 we are worse off then 1990 because the City and County of San Francisco, the Bay Area Air Quality Management, Environmental Protection Agency, San Francisco Health Department - refuse to enforce the laws and look the other side when it comes to the Bayview. The Mayor of San Francisco has been left in the dark and is not fully briefed on Energy Issues and the Hetch Hetchy Capitol Improvement Project. The City's Housing Element, the Transportation Document, the Hunters Point Shipyard, Education and Youth, Crime and Youth, the Homeless, and a host of other pertinent issues by people who are educated and informed. Talking about these issues in generalities will not help. Talking the talk but not walking the walk is worse. Mayor Gavin Newsom may not have all the experience he should have and he may not be able to gather all the right information on critical issues. It is imperative that those advisors who hang around the Mayor provide him the best information and suggest the best tools to address the critical elements to address Quality of Life issues. San Franciscans must pull together especially in times of budget woes. From time to time I do get an opportunity to address the Mayor of San Francisco. At these times together with other neighborhood groups the Mayor can get a sense of what is happening on some critical issues all over the City and County of San Francisco. Again and again when people hear about Bayview Hunters Point they feel and think that all that happens in the Bayview and Hunters Point are shootings and the worst crimes. That the neighborhood is a war zone and that it should avoided at all cost. This mentality is so pervasive that even the San Francisco Tourist Maps do not give Bayview Hunters Point respect - often times right where you should see Bayview Hunters Point - you have an advertisement. There is a lot of good going on in the Bayview Hunters Point and this has been going on for years. However, some officials in the City and County of San Francisco have chosen to shun the area and still continue to do so. It is good that Mayor Gavin Newsom is forcing others to notice and he has his own mind and wants to do things his way. Perhaps he wants to reach out and touch most in the Southeast Sectors as did former Mayor Alioto. Even today most people when you mention Mayor Alioto the first thing they tell you is that he was accessible and that he went out of this way to give qualified people jobs. One important element that raises Quality of Life are the constituents having good jobs. In recent years one does not feel the unity that existed all over the City and County of San Francisco many years ago. During the terms of Art Agnos, Frank Jordon, and Willie Brown - constituents have become decisive and this must be remedied. We have many constituents today who are trying their best to bring the youth together. It is important that parents and other adults work to bring about unity all over the City and County of San Francisco too. We cannot address Quality of Life issues when we have so many bums, prostitutes, drug peddlers, drunks and other indigents whiling away their time and making it difficult to address health and safety issues on 3rd Street in certain areas. The District 10 Supervisor - Sophie Maxwell has no clue what is happening in District 10. Especially on 3rd Street and Newcomb Street one can see a parade of the worst type of elements that adversely impact many other areas all over Bayview. The District 10 Supervisor has taken a ploy to work with San Francisco Planning Department to rezone areas and bring in developers so that poor folks are forced to leave the City and County of San Francisco. One already can see a huge population change and soon it is just a matter of time that African Americans will be less then 10 percent in the Bayview Hunters Point. The MUNI Lightrail will bring about many changes in two years time. The Bayview Hunters Point does not have a theater, good restaurants, clothing store, and a host of other facilities other communities enjoy. We have the Phelps Raw Sewage Treatment Plant, Power plants, companies creating dust, millions of vehicles plying on 3rd Street spewing diesel, the Darlin plant fouling the air producing tallow, and the list goes on. There is NO mitigation to bring about justice and address Quality of Life issues. We do not have an educated Community Based Organization in the Bayview Hunters Point to take the challenge and fully address adverse impacts with the constituents profiting from any solution. What we do have are CBOs making money of those they should be helping. Foremost among them Literacy for Environmental Justice, Arc Ecology, Bayview Hunters Point Advocates, Young Community Development with its past managers jumping ship. All of which will soon be audited by the Controller's Office. A similar audit should be conducted linked to CBOs and community services linked to health, youth services, job training, mental and drug services. Quality of Life issues are important but they are as important as we address them and more as we find solutions to addressing Quality of Life issues - with goals and definite time lines. We cannot help the constituents by taking millions of dollars from the City and County of San Francisco and seeing that most of it goes into the pocket of crooks.